Candles are practically synonymous with romance. Even a simple dinner by candlelight heightens the romantic atmosphere in the room. 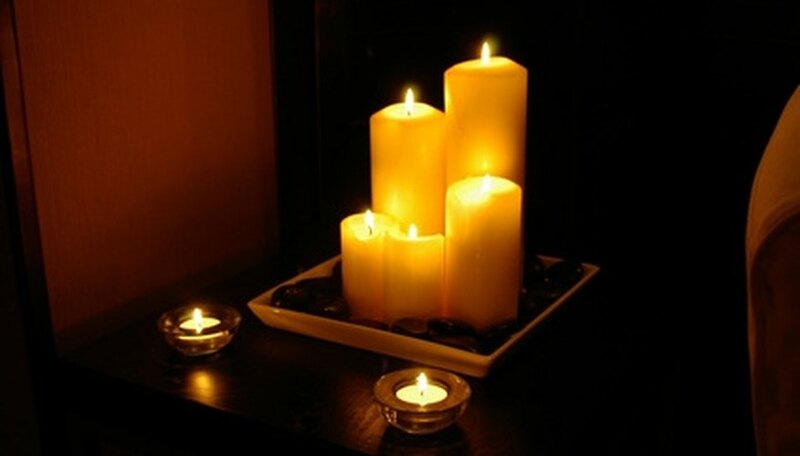 If you are planning a special evening with the one you love, incorporate candles to set the mood. Whether extravagant or simple, wow the person you love with a candle-lit evening she won't soon forget. Just remember never to leave candles unattended in a room and to put them out before you go to bed. Candles can spice up any romantic night. Place candles in votive candle holders in a large heart shape in your living room. Place comfy floor pillows and a rug in the circle as well. Invite your loved one to join you in the candle lit heart for a romantic picnic on the floor. Surprise your loved one with candles everywhere. Fill the room with candles of all sizes and shapes. Mix pillar candles and votive candles and line any shelves, counter tops and tables with them. Get some standing candle holders as well and spread those out throughout the room. The room will be impressive and very romantic with all the flickering candles. Be sure to have your loved one's favorite love songs playing. If you have an outdoor hot tub, lead a trail of candles from the back door to the tub. Circle the tub with candles as well. If you have any hanging plants, remove the plants and replace with hanging tea lights for an extra romantic feel. Surround the circled lights with plants to great a romantic garden feel. Leave one candle outside at the front door for your loved one to find. Have a note beside it that is a clue as to what room to go to for the next candle but that also has special meaning for the two of you. For instance, if you want to send him or her to the living room, the note could say something like "We first kissed under the mistletoe in this room." When you get to the living room, have another single candle waiting with a note that will lead her to the next room, until she finds you in the bedroom or wherever you want her to find you. Hold the last candle and deliver the last love message yourself. Hughes, Zora. "Romantic Candle Ideas." Dating Tips - Match.com, https://datingtips.match.com/romantic-candle-ideas-7643113.html. Accessed 18 April 2019.